Back in August, I took on the challenge of another cooking group. The Cottage Cooking Club is cooking through British chef Hugh Fearnley-Whittingstall’s cookbook, River Cottage Veg. This group is more relaxed than French Fridays. Each month, the group’s leader, Andrea, The Kitchen Lioness, selects a group of seasonal recipes to choose from. The plan is not for each person to cook every recipe in the book. We each pick from the month’s choices and across the group, the recipes all get made. At the end of the month, everyone posts about what they made. Some of our group members are ambitious and make most of the selected recipes. I’ve been more cautious and have committed to making just one or two each month. So far, all the recipes have been worth trying and this month’s were no exception. First, I made Leek and Chestnut Risotto. This is a pretty basic recipe with only leeks added to the rice. The sautéed chestnuts aren’t sprinkled on top until the end. 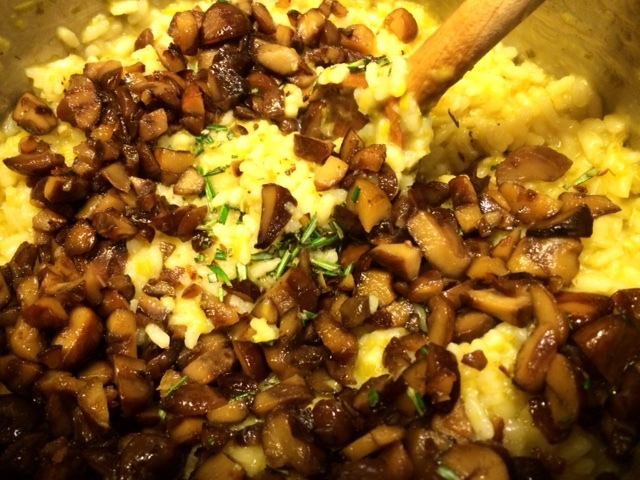 This recipe follows the traditional method for making risotto, requiring lots of time stirring the pot. I used squash stock I had made from the seeds and pulp from a butternut squash I cooked earlier in the week. We found the risotto to be on the bland side, but I think my stock was light on salt, and I didn’t season the final dish heavily enough. Truffle salt sprinkled on leftovers made a big improvement. My other choice was a winner: Corner Shop Spanakopita. I love spinach pie when I’m in a Greek or any other Middle Eastern restaurant that offers it, however, it’s not something I’d typically make at home. Fussing with the phyllo dough tries my patience. 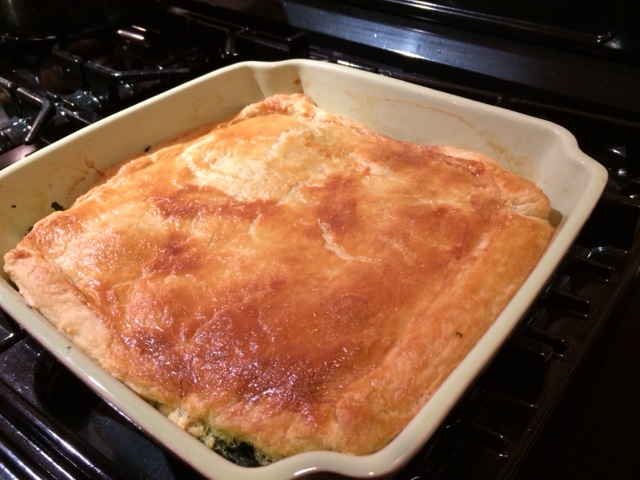 This recipe takes a different approach, topping the spinach filling with puff pastry. Brilliant! This spanakopita starts with frozen spinach. 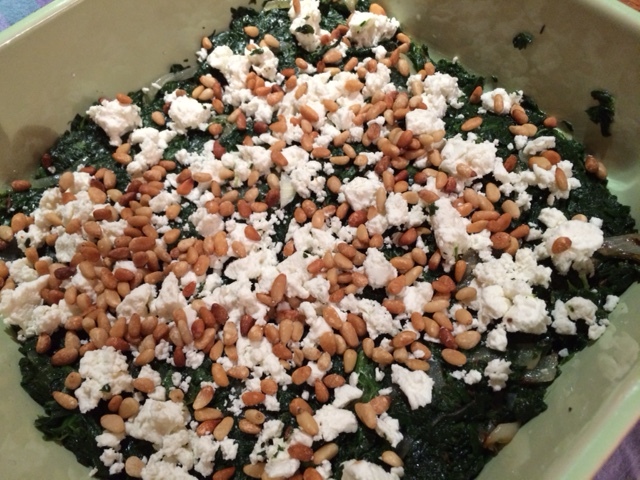 The recipe specifies whole leaf spinach. I’m not sure why it doesn’t call for the chopped variety because after defrosting, you coarsely chop the spinach anyway. Having made this once, I would buy chopped spinach next time. 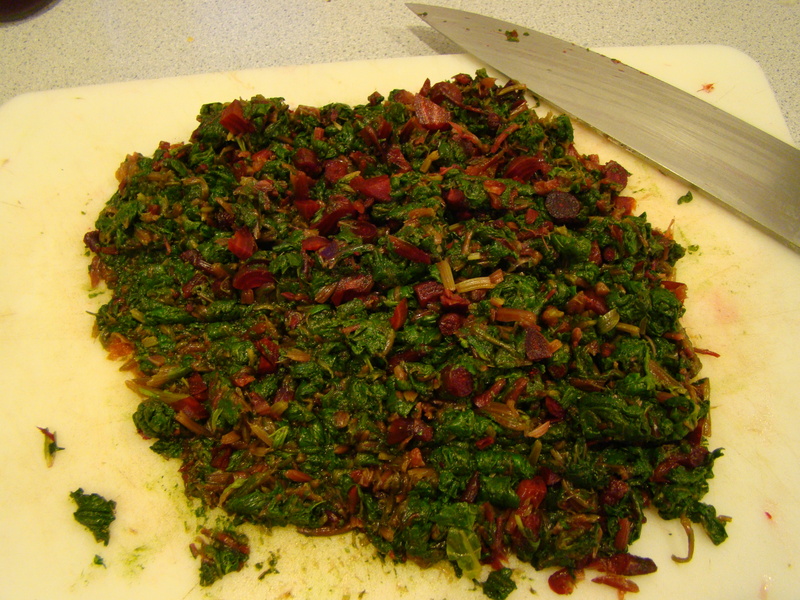 The spinach is combined with onions, cumin seed, and thyme that have been sautéed together, plus some egg for binding. Two layers of spinach separated by a layer of crumbled goat cheese and toasted pine nuts are topped with puff pastry and popped into the oven. I always have problems rolling out store-bought puff pastry after it gets unfolded, so, as crazy as it seems, I make my own “rough puff” and use that instead. It’s actually easier for me. 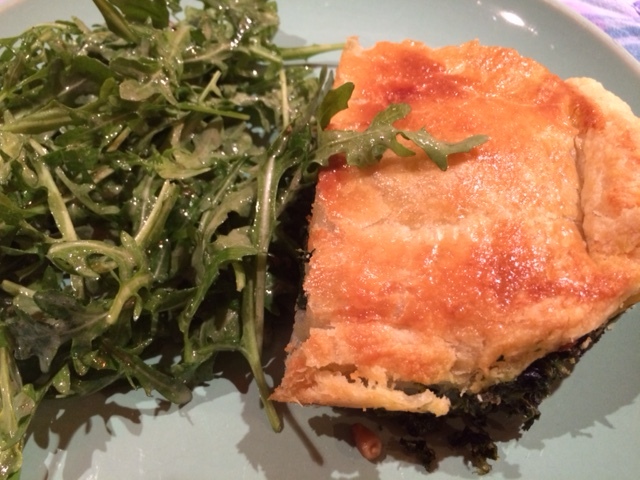 I served the piping hot spanakopita with a simple salad: baby arugula dressed with mustard vinaigrette. It was the perfect dinner on a winter’s night. This recipe earns a spot in my repertoire and will be repeated. As we approach the end of 2014, I want to wish all the cooks in the Cottage Cooking Club happiness and good health in the year ahead! I’ve enjoyed cooking with you over the past few months and look forward to finishing this project with you in 2015. Happy New Year!!! If you want to try this, here’s a version of the recipe here, though the original uses 2 pounds of frozen spinach. You can check out reviews of the other recipes selected for December here. First thing: Yesterday, we went into Boston to see the last of this year’s Huntington Theatre Company’s productions. We saw The Comedy of Errors, performed by the Propeller Theatre Company from England, which is being performed in repertory with Richard III, which we didn’t see. Propeller Theatre Company is an all-male troupe, just like Shakespeare was performed back in the day. All I can say is that it was HILARIOUS! Listening to Elizabethean English takes a while to get used to. It’s like listening to a foreign language. About halfway through the first act, the rhythm started to connect in my brain. But, the physical comedy made up for the words. The basic plot centers on a case of mistaken identity, actually confusion of two sets of identical twins, a pair of masters and a pair of slaves. Everyone is getting the twins confused, the wife, the sister-in-law, the merchants, even the masters and the slaves. Two hours of belly laughter. If you live in the Boston area and have some free time between now and June 19, you must try to see this show. Second thing: Of course, it has to be food related. I picked up a huge bag of beet greens at the farmstand in Maine and was inclined to make a quiche. A tour of the fridge indicated something Greek inspired was the way to go. I combined sauteed greens with feta cheese and olives. I baked the crust in a springform pan, making the sides higher than the typical removable-bottom quiche pan. It made a nice, solid, tart; perfect for lunch with a salad. 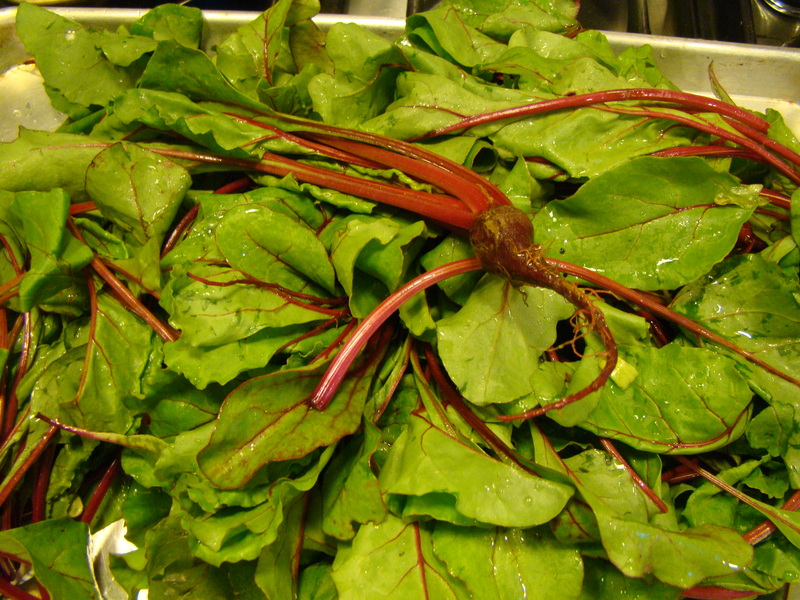 It had a funny pink tinge from the beet greens, but the flavors were delicious. I can’t wait to make it again. On a well-floured surface, roll out the pastry crust to a 14-inch circle. Transfer to a 10-inch springform pan. The sides should be about 2 inches high. Prick the dough all over, including up the sides, with a fork. Chill the dough in the pan for at least 30 minutes. Partially bake the crust. Preheat oven to XXXF. Place a piece of parchment paper on the crust and fill completely with dried beans or pie weights. (I use a jar of small white beans, 1 to 2 pounds, which I can use for about a year before needing to replace.) Place pan on a baking sheet. Bake for 12 minutes, until set. Carefully remove the parchment and beans. Return to the oven for another 5 minutes or so until it just starts to brown. Make filling: In a large skillet, heat the olive oil. Saute the onions and garlic until soft. Add the beet greens and cook until wilted and most of the liquid as evaporated, about 8 minutes. Transfer to a cutting board and coarsely chop. In a large bowl, lightly beat the eggs. Add the milk. Stir in the beet greens, feta cheese, and olives to combine well. Pour the filling into the crust. 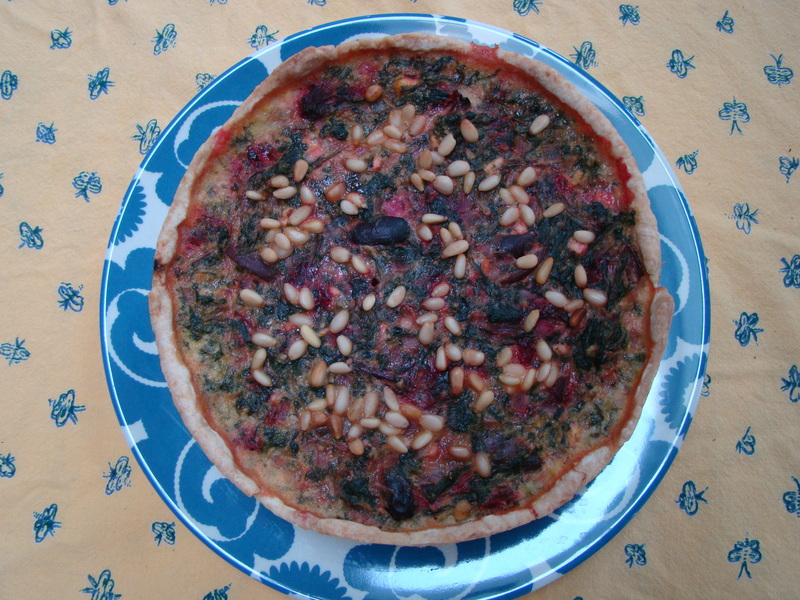 Sprinkle with pine nuts. Bake for 40-50 minutes, until center is set. Transfer pan to a wire rack to cool.